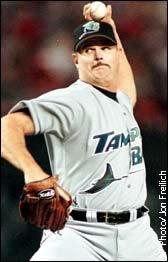 Did Jim Morris really test his fastball speed by throwing past a speed limit monitor on the side of the road? It was a great scene for the movie, but it never actually happened. In an interview Jim Morris addressed this by saying, "You know, one of the things that (writer) Mike Rich (fictionalized) in the script was the radar on the side of the road. Dennis did a great job in that scene, but it was just to let people know I had no idea how hard I threw." Did the lights in the radar gun really burn out like in the movie? Morris answered this in an ESPN interview by saying, "I don't know if it was burned out. Doug Gassaway, the original scout that looked at me, shook the gun, and it wasn't even registering it. They had two or three guns out. Then they were shaking the gun the first four or five pitches. They couldn't believe the velocity. The movie is pretty accurate. I'm very happy with it. The thing we wanted, the message we wanted to convey was that it's not a baseball movie. It's a family-oriented movie. It entails relationships with high school kids and adults, adults and adults, adults with children. Baseball just happened to be the dream that I pursued." Did Jim Morris really strike out Royce Clayton in 3 pitches? It was actually 4 pitches. It was cut down to 3 for the film because another pitch would have taken another minute. Why did Jim Morris retire from major-league baseball after just 2 seasons? Morris told ESPN, "I realized a dream I'd had since I was 3. But I wanted to spend more time with my kids, and help them pursue their dreams." When asked what kind of dreams do his children have, Morris replied by saying, "Have you seen the movie? Well, there's this one scene that depicts me and my father and how we got along. I want my kids to grow up and enjoy their childhood and be carefree. I never really got a chance to be a kid." Was Jim's father really so one-dimensionally against baseball? About his father, Morris said the following, "He wasn't against baseball. What happened in my father's life was, he was supposed to sign a contract with the Mets, and two weeks before he was to go to spring training, he hurt his shoulder playing football in the front yard - I mean to the point where he couldn't throw again. I think he tried to live through me and make me a perfectionist at the sport, which made it really hard on me." What other dreams does Jim have? In the interview with ESPN, Morris said, "The only thing I never tried to pursue is my football career. When I was 28, I played at Angelo State in San Angelo, Texas. I was an All-American and led the country in punting. I lettered two years. I led the conference one year, and led the country the next. Averaged 44.5 yards." Does the real Jim Morris appear in the film? Jim does appear in the film as one of the umpires (Orlando Umpire No. 2). He also worked closely as a consultant for the movie. What is Jim doing now that he is retired from baseball? Jim appears across the country as an inspirational speaker. He also volunteers a lot of his time with high school baseball in the Dallas area where he lives. 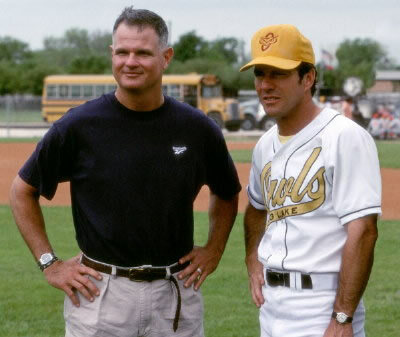 In these video clips, the real Jim Morris talks about his grandfather, his life, the movie, baseball and more. The videos include an interview and a clip of him during a motivational speaking engagement. "I don't know if I want anybody to walk away from the movie thinking about me specifically," Morris said. "I do want them to walk away asking themselves, 'Well, if I get a second opportunity at something, I should walk through that door.'" Thirty-five-year-old highschool science teacher and baseball coach Jimmy Morris (Dennis Quaid) learns that childhood dreams can come true no matter old you are, as he agrees to try out for the majors if his team makes the playoffs. We watch Jim attend tryouts and work his way through the minors toward his dream, while remaining a strong husband and father.